Gain a nationally accredited qualification in beekeeping while you work in the Beekeeping Industry. 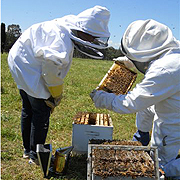 Beekeeping traineeships are open to paid employees of beekeepers. The traineeship leads to a nationally accredited Certificate III in Beekeeping AHC32016 qualification. Training includes a blend of face to face, online courses and workplace assessment, all including practical components with hands on exercises involving bee hives and various beekeeping equipment. The applicant must successfully complete 12 core units and four elective units, as shown in Course details, to attain a Certificate III in Beekeeping. Smart & Skill Course Fee: This course fee is considered a student contribution to the full cost of training, the difference being subsidised by the State Government. The fee payable depends upon eligibility and access to concessions or exemptions. Traineeships attract substantial subsidies for employers and allowances for employees (including for accommodation and travel). Contact an Australian Apprenticeship Centre or the Traineeship Coordinator at Tocal for more information. Once you have completed your application you will be contacted by one of our Traineeship coordinators.